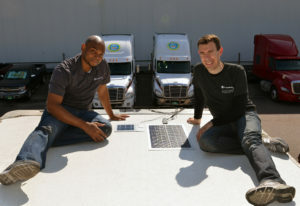 The study phase is beginning for solar PV integrated reefer truck rooftops. Fraunhofer CSE (in Boston, MA) and Fraunhofer ISE (in Freiburg Germany) are working in cooperation with Agri-Mark/Cabot Creamery Cooperative, based in Vermont, on an installation of solar PV modules onto two Cabot Creamery refrigerated trucks for an initial 3-month study. This study will record the amount of energy that could be potentially produced by the Cabot trucks, as they are completing their dairy deliveries across the Northeast US, if rooftop mounted solar PV modules were installed. 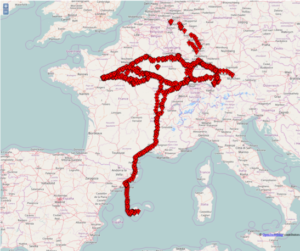 Concurrently, four trucks from German logistics companies are also equipped with identical monitoring hardware and have been recording the solar potential on transport routes across Central Europe since June. The real-time data collected will be used to realistically determine the potential energy savings by measuring the irradiation from truck-based solar. Only rough yield estimates have been done in the past. This is the first part of a potential longer study and pilot. For the next step, Fraunhofer will develop specially customized PV modules adapted to the special needs of utility vehicles as standard PV modules are not suited for this type of use. Fraunhofer is very pleased to be working with Cabot Creamery to find solutions in sustainability and renewable energy. Funding for this project was provided by the Zayed Future Energy Prize, which was awarded to Fraunhofer ISE in 2014 (see Fraunhofer ISE’s press release here). The prize represents the vision of the Late Founding Father and President of the United Arab Emirates, Sheikh Zayed bin Sultan al Nahyan, who championed environmental stewardship. Lindsey Dillon is Fraunhofer CSE’s Marketing Manager. She is responsible for all marketing collateral and CSE’s outreach and social media communications.